Battle of Sinop Day is one of the Russian days of military honors. 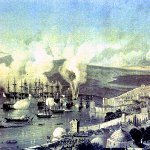 This day is observed on December 1 to commemorate the events of 1853, when Russian and Turkish troops started military actions at the seaport of Sinop in northern Anatolia. The Battle of Sinop was a part of the Crimean War, that lasted from October 1853 to February 1856. During the battle the Russian Black Sea Fleet under command of Pavel Nakhimov defeated the Turkish squadron. It's interesting, that the weather wasn't favorable for the Russian fleet on the day of the battle. However, even bad weather didn't become an obstacle for the Russian fleet and soon the Turkish squadron lost its ships. The victory in the Battle of Sinop became one of the days of military glory in the Russian Federation, and one more reason for the Russian military personal to be proud of their work. However, the historical consequences of the victory were negative for Russia, because after the Battle of Sinop France and Great Britain were also involved in the conflict.